If you are looking for coins with definite investment potential, gold coins are an excellent place to start. 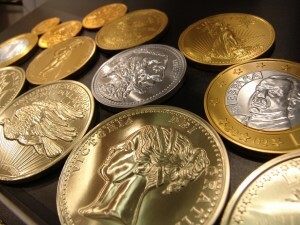 Though they are expensive when starting out, the investment value of gold itself makes them a very attractive option. And, because gold is bought and sold routinely on the commodities market, it is easy to stay on top of the price of gold, making it easy to follow the price of your gold coins. Which makes gold coins the equivalent of stocks or bonds for the coin collector. Admittedly, it is not always easy to get into the market for gold coins. After all, gold is expensive, so coins made from gold are going to be pretty pricey. However, there are usually several weights available, so you will be able to find something that will fit your price range. However, when looking for gold coins, it is usually fairly easy to find a dealer. Many coin dealers are attached to the gold coin market and, if they cannot sell them to you directly, they will be able to connect you with someone who can. There are also several internet merchants who offer gold coins, but it is a good idea to be careful when shopping on-line. After all, there are a lot of proper merchants out there, but there are also a lot of shady folks looking to make some quick money. So, before purchasing on-line, do some research and check the vendors out thoroughly. Be especially careful of anyone selling coins for prices that are lower than the market value for gold. This is a case where anything that seems too good to be true absolutely is too good to be true, because nobody is going to sell you anything at a loss - especially not a commodity like gold. Of course, because gold is a commonly bought and sold commodity, the value of your gold coins can be tracked easily. The price can be found on-line, in the newspapers, and on the evening news. And, because the prices of gold coins are tied to the price of the gold that it contains, you don't have to worry about the coin market itself. While collectible coins may have upswings and downswings, gold not only increases in value over time, but it also tends to keep its value very well. Which means that gold coins are a way to stabilize your investments as you place your money into a very tangible resource. When looking for a solid investment that does not require a great deal of knowledge and research, gold coins are a very good place to start. They are easy to find, their value is easy to determine, and they are steady, reliable investments that will hold their value better than almost anything else. And, let's face it, gold coins are just plain neat to look at. So, if you are looking for a tangible, sturdy investment that is not only valuable, but attractive as well, gold coins will make you happy every time.